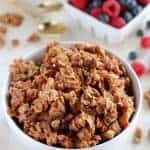 A low-carb, Grain Free Paleo Granola filled with nuts, seeds, coconut and honey. Sweet, salty, crunchy and satisfying. You won’t be able to stop eating this! Preheat oven to 325°F. Line a baking sheet with parchment paper or silicone liners and set aside (do not skip this step, the granola will stick if directly on the baking sheet). In a large bowl, combine nuts, seeds, almond flour, coconut, cinnamon and salt. Set aside. In a small saucepan, heat coconut oil and honey until smooth and combined. Stir in vanilla extract. Pour over nut mixture and stir until well combined. Dump the mixture onto the prepared baking sheet and spread into an even layer. Bake for 15-20 minutes until light golden brown, rotating the pan halfway through the cook time. Keep a close eye on it so that the nuts don't burn. Begin checking it around 13 minutes , and then every 2 minutes after. Place the pan on a wire rack to cool completely, the nuts will firm up as they cool. Break into irregular pieces and store in an airtight container. Salt: If any of your nuts are salted you will not need to add much (if any) salt. Taste it as your making it and add salt as desired. Honey: This is a lightly sweetened granola. If you prefer it sweeter increase the honey to 1/3 cup. Taste it before baking it and add more honey, if desired. Soaking/sprouting nuts: If you have trouble digesting nuts you can soak the raw nuts in salted water overnight. You will then need to dehydrate the nuts before proceeding with this recipe. Read more about soaking nuts here.